If your grip gives out while performing in the gym (or even while carrying grocery bags), you need to strengthen your forearm and finger muscles. The forearm controls most of the strength of your grip, and forearm and finger muscles are often the weakest links in heavy exercises like the deadlift, pull-ups or other movements that require lifting heavy weight. Weak forearms are often an obstacle to performing exercises used primarily for strengthening other muscle groups. One of the best ways to improve your grip is using hand grip strengtheners. I've reviewed the top products and determined the best grip strengthener you can use to maximize the strength of your grip, whether for handshakes, rock climbing, or powerlifting. No joke, the 5 products below are the best grip trainers I've ever seen. If you're searching for the best grip strengthener then the MummyFit Death Grip may easily fulfill your expectations. The UK based brand is a respectable manufacturer of exercise equipment strengtheners, which they easily prove with this top-notch product. The adjustable hand grip strengthener offers a wide range of difficulty settings, as it can be adjusted from 55 lbs up to 154 lbs of grip resistance, easily replacing fixed hand grip strengtheners. This particular exercise apparatus is ideal for everyone intending to use it while sitting in the office and working, because it's made with the goal of being as silent as possible. If you're intending to exercise at work you won't be bothering your other colleagues while working out with this highly resistant product made from thermoplastic nylon and steel. There're many eloquent features to this product that make it the best hand grip strengthener. Apart from the really durable materials it's made from, the ease of use and the fact that the spring coil doesn't need to be unhooked to change the set difficulty. The only real headache this hand grip strengthener can bring an average user is the fact that the minimal resistance of 55Lbs may be too high for most users. Also, it can be a bit problematic to determine how much resistance you're exercising with, as it's hard to understand the indicated pounds of resistance on the device. To sum it up, MummyFit's Death Grip, apart from an interesting name, offers a silent device with adjustable resistance levels suited for people wishing to increase their grip strength. This is the best hand grip strengthener I've tried. The second hand strengthener I've checked out for you guys is the Hand Grip Strengthener Workout Kit by Mandrill. The apparatus from the kit that's really important for this review is the included hand grip strengtheners. It's an adjustable hand grip trainer able to offer resistance from 22 Lbs to up to 88 Lbs. Apart from the hand gripper, this package also includes a finger strengthener and a exercise ring. They even offer an ebook so users can know exactly how to exercise in the most effective way. And all of that can be stored in the handy carry bag that's part of the package. This package offers tools to strengthen every aspect of your hand, from individual fingers to the muscles of your complete fist. The equipment feels comfortable while using, even though there's been some concerns over the quality of the material provided. Even so, users report exercising with the product as part of physical therapy, and with great success. But for the price, it's a great deal. Another issue may be that some of the equipment this product provides may be useless to you. and you may end up not exercising with the whole set. I'd recommend this product to those that want to try to supplement their use of traditional grip strengtheners with a few extra components. Even if you use it only to combat stiffness and fatigue in your hands, you may end up using the whole package. The GD Grip Pro-70 hand grip strengthener is another adjustable grip strengthener with very similar stats to the MummyFit. The adjustable resistance can vary between 55 Lbs to a maximum of 154 Lbs, so if you're a beginner or an advanced trainee looking for a solid choice, this may be for you. The springs are made with durability and quality in mind, and the steel and thermoplastic nylon materials compliment the high-strength mold springs. This particular grip strengthener comes with a nice, solid string that'll enable anyone to easily carry it around with them. Paired with the fact this device is not as noisy as the competition, it's an ideal exercise equipment for anyone on the move, in public transport and in the office. Also, the fact that this hand grip strengthener has the spring in compression, while most other hand grip strengtheners keep the springs under tension, which speaks of the quality of the product. 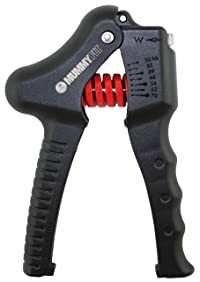 This is easily one of the most easily transportable hand grip strengtheners I've tried, it can fit into an average pocket, and the springs don't get stuck in fabric. The main complaints some users have talked about, and I've noticed, is that the higher the tension the less compression of the spring happens. This means the range of motion path your hand moves to grip the device lessens with every pound you crank up. All in all, a quality product that's easy to carry around without losing it or making other people aware you're using it. The Vive Grip Strengthener product is somewhat different from the other hand grip strengtheners I've reviewed. It's a collection of round, silicone squeezer grippers with the same basic goal of making the strength of your grip increase. While this product is not adjustable in itself, it compensates that with different silicone rings set at different resistance levels you can easily choose from. The rings are color coded, and they look interesting and fun. 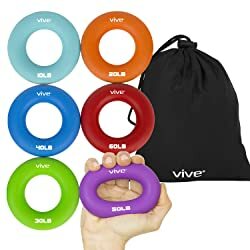 If you're looking for a few separate products with the same function, this package offers a set that comes with 6 rings with resistance ranging from 10 Lbs to 60 Lbs. What makes this hand grip strengthener interesting and useful is the advantage it has over other materials. Because it's made out of silicone it doesn't slip, unlike other hand grip strengtheners. If you're worrying you'll lose the individual rings, you can put them in the provided high quality bag to make sure they're all accounted for. They're a great aid for anyone using it to strengthen their grips and even as part of a rehabilitation effort. If you're a musician it may help your performance, too. And if you're worrying about the quality, these rings are less prone to damage then the other hand grip strengtheners I've reviewed. These extra durable and non-slippery hand grip strengtheners in the form of a ring are for anyone wishing to improve their grip strength without having to worry about damaging the product and keep things interesting with different variations of the product. 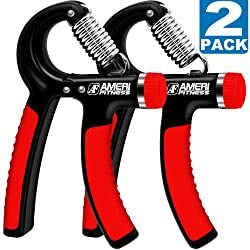 The Ameri Fitness hand grip strengthener is a solid choice for anyone looking for an affordable, but quality product. The package includes a set of two hand grip strengtheners that equally provide resistance for every finger of the hand. This hand grip strengthener is adjustable as well, offering resistance in the range from 22 Lbs to 88 Lbs. If you're concerned with the quality of the product, rest assured that the stainless steel and rubber combination gives a solid and pretty resistant product to one of the best hand grippers I've reviewed. It's also suited for a wide range of users, and with the adjustable knob it's very easy to set up the difficulty. It doesn't matter if you're a newbie or a pro. The sturdy and comfortable handles are properly sized, and so they rarely slip or are tricky to use. Even so, there have been some problems with the dial. The little knob that regulates the resistance isn't very responsive, so it may take a moment for you to adjust the weight to a level you feel most comfortable exercising. Considering this is the cheapest option on the list, and that you get two hand grip strengtheners from this deal, it's a very good bargain. There are some problems with adjustment of the resistance, and generally low levels of difficulty compared to other hand grip strengtheners I've reviewed. Even so, this is the best you can get for the least amount of money. In this review we've presented two variations of the hand grip strengthener. Those are the hand grip strengtheners with adjustable and fixed resistance levels. If you're looking for a hand grip strengthener that can keep up with you as you get stronger, the adjustable type is perfect for you. They're made in mind to grow with the trainee, and are very user friendly. That means a complete beginner can pick one up and start building their grip strength, without having to worry over the level of difficulty. They can choose that themselves. On the other hand, fixed hand grip strengtheners are, as the name says, stuck at a certain difficulty level that can't be adjusted. That means you need to be careful gauging your own strength as you won't be able to exercise with a grip strengthener of a certain tension. Even so, they have the best overall quality, as they often have less or no moving parts. Compared to the adjustable hand grip strengtheners, they're more efficient but also more expensive. As it was previously mentioned, it's incredibly important to be honest and pick an option that you'll be able to use to exercise effectively. If you're unsure, and unable to try it out yourself, pick an adjustable hand grip strengthener with a wide range of resistance or pick a package of multiple fixed hand grip strengtheners. Either way, if you exercise you'll make use of every one of them, it's only a matter of time. There are three major types of hand grip strengtheners which depend on the mechanism that generates resistance and the general area of effect. As the name suggests, have a spring that's used to achieve resistance. Usually, the length of the spring and the tension it's under will determine the difficulty level of the grip equipment. On the other hand, hand grippers that use coils as a mean of achieving resistance are somewhat different. They're built around a metal coil that after every use and rep returns to its original position, on the negative (eccentric) part of the exercise. The third type differs from the other two because it allows people training with them to exercise each individual finger, rather than the entire hand at once. Regular exercise with hand grip strengtheners can have many positive effects. On one hand, it's used to increase size of the muscles in your forearms, which will make them stronger and in turn, your grip too will grow stronger too. Also, a study has shown that grip and muscle strength in healthy weight adults is lower in individuals with diabetes (whether diagnosed or not) and hypertension. While the size and strength of your forearms muscles will increase with regular exercise, so will the strength of your individual fingers. This type of conditioning is primarily useful for musicians like pianists and rock climbers, as their finger strength can affect their performance. The best hand grip trainer to use in order to maximize finger strength is the articulated hand grip strengtheners. One other major benefit, for musicians and athletes alike, is the improved hand endurance. Basically, the time you'll be able to exert force with your hand will grow, and fatigue during use of your hands will lessen. With increase in size and strength of forearms will come a decreasing of the risk of injuries. The stronger muscles will protect your tendons and joints from being damaged easily while doing physical activities such as fighting sports or sparring. 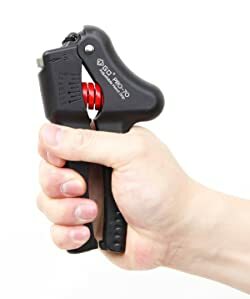 In other words, any tasks dealing with hands (punching, catching, throwing, hanging, climbing, playing an instrument, etc) will increase the performance in tasks demanding those types of movement, as this product is the best hand exerciser. By combining all these benefits, the logical conclusion is that regular exercise with hand grip strengtheners will also affect and allow you to improve on your athletic performance. Using a hand grip strengthener is simple. First, you need to secure the hand strengthener in your hands. Grip the hand grip strengthener until it's comfortable in your palm. Then squeeze. You need to complete the motion and allow the handle to close around your grip. After a brief period, release your hold and allow the hand grip strengthener to return to its starting position. Incorporating hand grip strengtheners into your regular exercise routine will bring you all the listed benefits I've previously talked about. But there are different ways to do that. If you own an adjustable hand grip strengthener, here's a simple routine you can do after your workouts in the gym or even on your rest days. You'll be doing 4 sets of using the hand grip strengthener. The simple formula is this 4x12-10-8-6. You can do this a few times a day. This means you'll be lowering the number of repetitions as you increase the resistance. Find a comfortable resistance level that allows you to do 12 reps and pump them out. After a pause between 25 to 45 seconds increase the resistance and do 10 reps. Repeat that until you've completed 6 reps with the highest level of resistance you can manage. As previously discussed, to properly use the hand grip strengthener, squeeze and hold in position for about 5 seconds, then release into starting position. If you own a fixed resistance hand grip strength trainer, you can increase your time under tension to make the best use of the piece of equipment. Beginners should hold the grip strengthener squeezed for 5 seconds, and every rep they'll do after they should add another 5 seconds. For example, it would look something like this. The first set you made 12 reps for 5 seconds. The second set you'll do the same number of reps, but hold your hand closed for 10 seconds in total, increasing the time under tension. And so on. These two workout suggestions should also include regular exercise not limited only to your forearms. For best results, regularly exercise every muscle group at least once a week. This grip strengthener review should be able to help you out with that. This review should help you to find the best grip strengthener, regardless of the experience level and strength of the person looking for the best hand grips. I've reviewed five amazing products, each with unique benefits that make them one of the best hand grippers on the market. Even so, the hands-down winner of this review, and the #1 best grip strengthener is the MummyFit's Death Grip because of its quality, utility and price. 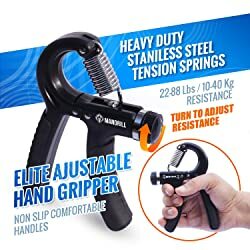 The option I'd recommend anyone looking for the best affordable grip trainer that's also easy to use is the Ameri Fitness Hand Grip Strengthener.